Nifty opened gap-up but was sold off immediately to the lows of the day at 5865, a huge loss of 100 points from the top. The responsive buyers took control from the lows to move the index back into positive territory and closed at 5930.20, a gain of 26.10 points. The broader market though was negative, with just 588 advances to 686 declines. 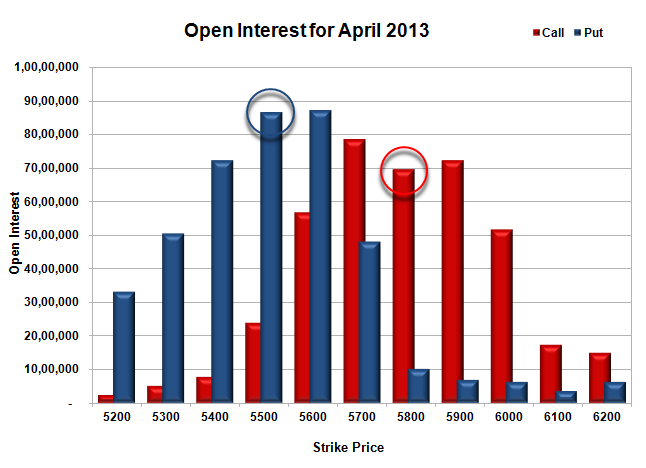 Option Table is gathering support around 5800 level. 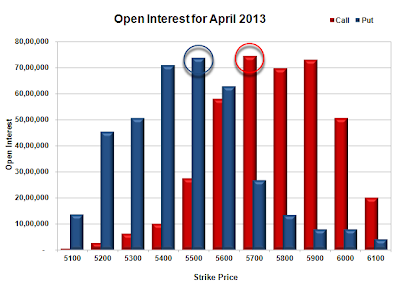 Call option 5800-6400 added 21.69 lacs huge amount of OI with short covering seen at 5700 and below strike prices. Put option 5800-5400 added 24.92 lacs huge amount of OI with small short covering seen at 5900 and above strike prices. Highest accumulation on Call option 5900 at 50.38 lacs & 6000 at 45.57 lacs whereas Put option 5800 at 63.34 lacs & 5700 at 62.80 lacs. 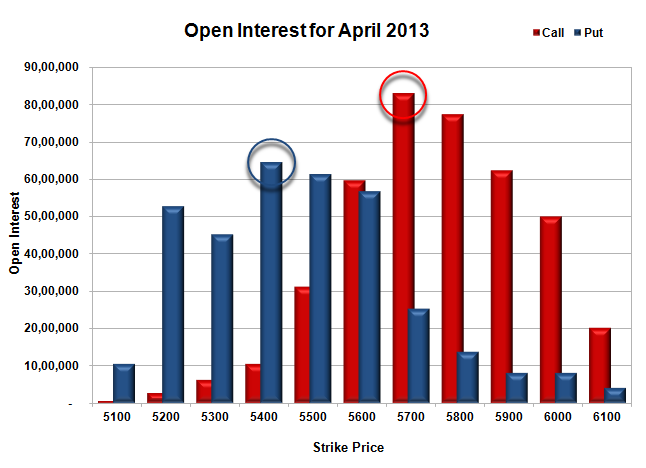 Nifty Open Interest is at 1,65,28,100 up by 3,65,800, with increase in price, most probably long build-up. 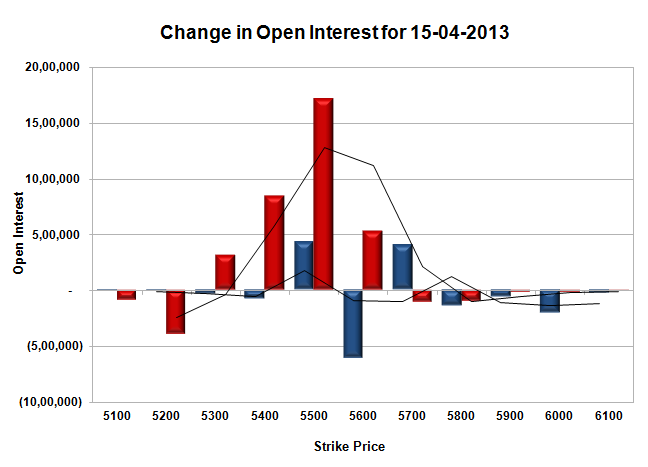 Bank Nifty Open Interest is at 15,40,100, down by 33,800, with decrease in price, most probably long liquidation. FII’s sold small 0.44 lacs of Futures, most probably short build-up, as their net OI increased by 13946 contracts and the average price per contract comes to around 5959. FII’s future open contract as on date is 354564. PCR Open Interest (Volume) is at 1.178. 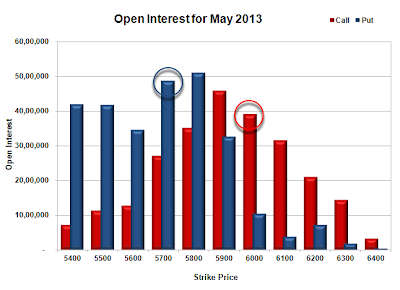 Initial very good support at 5800, with highest OI of 63.3 lacs and below that at 5700 with OI of 62.80 lacs. 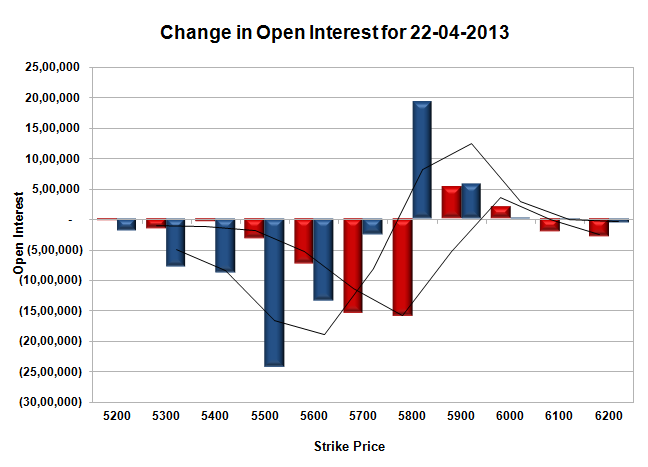 Resistance right now at 6000, with huge OI of 45.57 lacs and above that at 6100 with OI of 42.71 lacs. 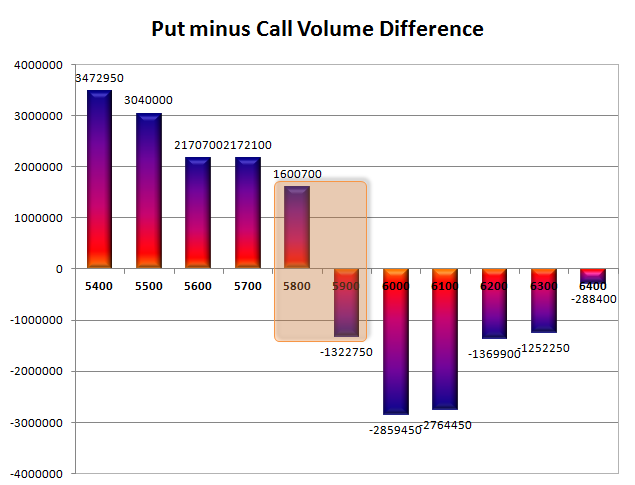 Range as per Option Table is 5867 - 5977 and as per VIX is 5883 - 5977 with 5920 as the Pivot. The index opened flat and stayed within a narrow range but gathered momentum as Europe opened to move to the highs of the day around 5920. The index ultimately closed just below at 5904.10, a good gain of 32.65 points. The broader market was also positive, with 724 advances to 554 declines. Support gathering momentum around 5800 level in Option Table. Call option 5900-6400 added 12.85 lacs huge amount of OI with small short covering seen at 5700 and below strike prices. Put option 6000-5600 added 17.88 lacs huge amount of OI with small profit booking seen at 5500 and below strike prices. Highest accumulation on Call option 5900 at 46.65 lacs & 6000 at 41.68 lacs whereas Put option 5700 at 55.03 lacs & 5800 at 54.62 lacs. 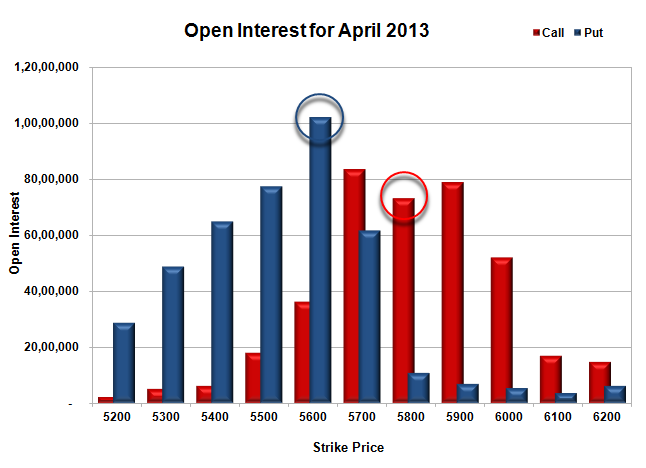 Nifty Open Interest is at 1,61,62,300 up by 3,46,750, with increase in price, most probably long build-up. Bank Nifty Open Interest is at 15,73,900, up by 99,525, with increase in price, most probably huge long build-up. FII’s bought small 0.2 lacs of Futures, most probably long build-up, as their net OI increased by 10328 contracts and the average price per contract comes to around 5953. FII’s future open contract as on date is 340618. PCR Open Interest (Volume) is still holding-on at 1.161. Initial support at 5800, with OI of 54.6 lacs and below that at 5700 with highest OI of 55.03 lacs. 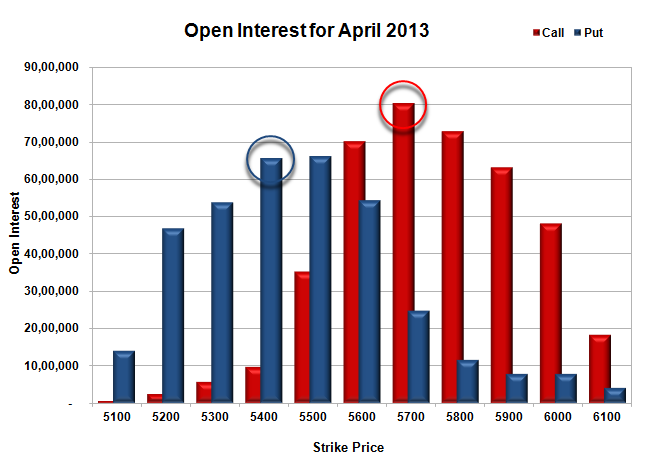 Initial and best resistance right now at 6000, with huge OI of 41.68 lacs. 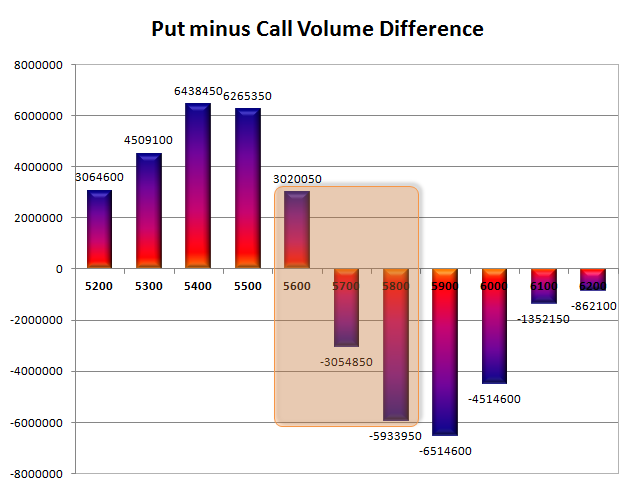 Range as per Option Table is 5844 - 5955 and as per VIX is 5860 - 5948 with 5900 as the Pivot. The index just below 5900 and stayed down for the entire session with a pullback around the second half sold off to the lows of the day around 5860. The index ultimately shut shop at 5871.45, a good loss of 44.85 points. On a week-on-week basis the index though gained 88.35 points or approx 1.53%. The broader market was also negative, with just 489 advances to 802 declines. The Option Table though is not showing much of a dent with good support building up around 5800 level. Call option 5900-6200 added 22.25 lacs huge amount of OI with small profit booking seen at 6300 and above strike prices. Put option 5900-5400 added 18.35 lacs huge amount of OI with small short covering seen at 6000 and above strike prices. Highest accumulation on Call option 5900 at 45.89 lacs & 6000 at 39.11 lacs whereas Put option 5800 at 51.08 lacs & 5700 at 48.80 lacs. 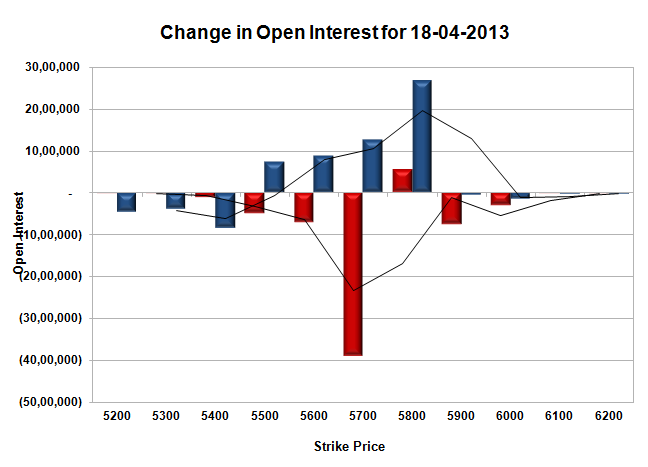 Nifty Open Interest is at 1,58,15,550 up by 7,97,900, with decrease in price, most probably short build-up. 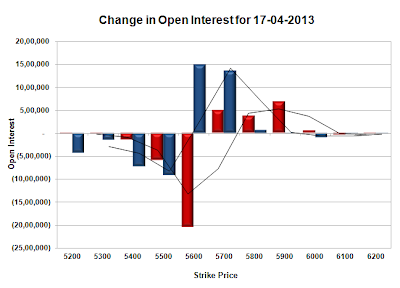 Bank Nifty Open Interest is at 14,74,375, up by 18,275, with decrease in price, most probably short build-up. FII’s bought huge 5.01 lacs of Futures, most probably long build-up, as their net OI increased by 32108 contracts and the average price per contract comes to around 5921. FII’s future open contract as on date is 330290. PCR Open Interest (Volume) is just hovering around 1.153. Initial and best support at 5800, with highest OI of 51.08 lacs and below that at 5700 with huge OI of 48.80 lacs. Initial resistance right now at 5900, with huge OI of 45.89 lacs and above that at 6000 with OI of 39.11 lacs. Range as per Option Table is 5821 - 5934 and as per VIX is 5829 - 5914 with 5880 as the Pivot. The index opened positive around 5870 and settlement day saw huge short covering rally to take Nifty above 5900 after 26 sessions and closed at the high point of the series at 5916.30, a huge gain of 79.40 points. The broader market was also positive, with 697 advances to 598 declines. Option Table for May Series is tilted towards the Bulls, with not much overhead resistance right now. Call option 5500-6400 added 60.92 lacs huge amount of OI. Put option 6200-5400 added 90.72 lacs huge amount of OI with profit booking seen at 5300 and below strike prices. Highest accumulation on Call option 5900 at 41.67 lacs & 5800 at 34.86 lacs whereas Put option 5800 at 48.66 lacs & 5700 at 45.65 lacs. Nifty Open Interest is at 1,50,17,650 up by 60,51,950, with increase in price, most probably rollover with some long addition. Bank Nifty Open Interest is at 14,56,100, up by 6,88,675, with increase in price, most probably huge rollover with some long addition. FII’s bought huge 62.61 lacs of Futures, most probably short covering, as their net OI decreased by 102440 contracts and the average price per contract comes to around 5962. FII’s future open contract as on date is 298182. 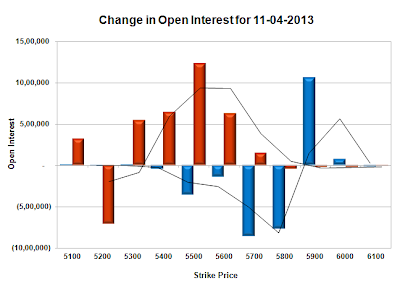 PCR Open Interest (Volume) at start of series is comfortably placed at 1.179. 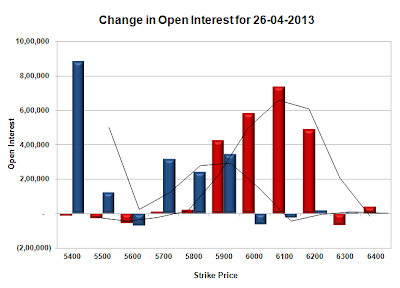 Initial support at 5800, with highest OI of 48.66 lacs and below that at 5700 with huge OI of 45.65 lacs. Resistance right now at 6000, with OI of just 33.29 lacs. Range as per Option Table is 5845 - 5960 and as per VIX is 5872 - 5960 with 5900 as the Pivot. The index for a change opened flat and went down with each passing hour but saw a huge comeback from just below 5800 level as Europe opened positive. The index ultimately closed positive at 5836.90, a small gain of 2.50 points. The broader market was just negative, with 637 advances to 664 declines. The Option Table is delicately placed within a range of 5800-5900, hope to see a huge volatile move on the D-Day. 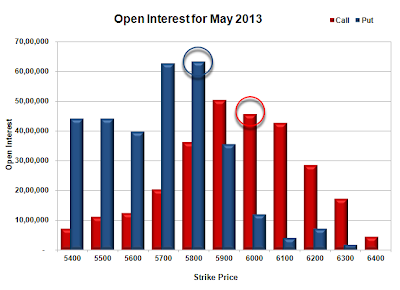 Call option 5900-6000 added 4.30 lacs huge amount of OI with huge liquidation seen at 5800 and below strike prices. Put option 5900-5700 added 10.12 lacs huge amount of OI with profit booking seen at 5600 and below strike prices. 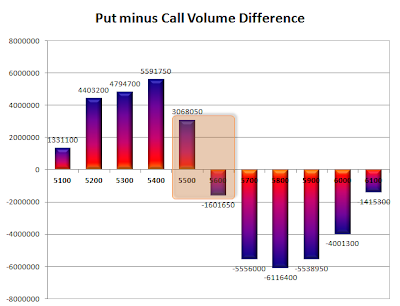 Highest accumulation on Call option 5900 at 80.45 lacs & 5800 at 53.87 lacs whereas Put option 5600 at 86.88 lacs & 5700 at 73.26 lacs. Nifty Open Interest is at 1,14,31,100 down by 28,25,150, whereas May series added 26.66 lacs, with small increase in price, most probably rollover with some short covering in current series. Bank Nifty Open Interest is at 11,37,450, down by 4,85,375, whereas May series also added 3.05 lacs with small decrease in price, most probably huge rollover with some long liquidation in current series. FII’s bought huge 16.08 lacs of Futures, most probably long build-up, as their net OI increased by 8594 contracts and the average price per contract comes to around 5890. 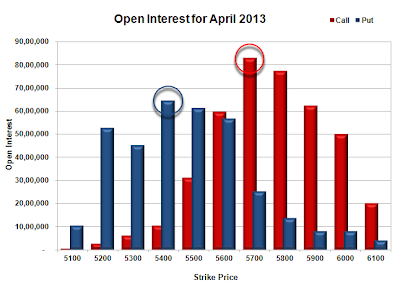 FII’s future open contract as on date is 400622. PCR Open Interest (Volume) is at highest of the series now at 1.530. 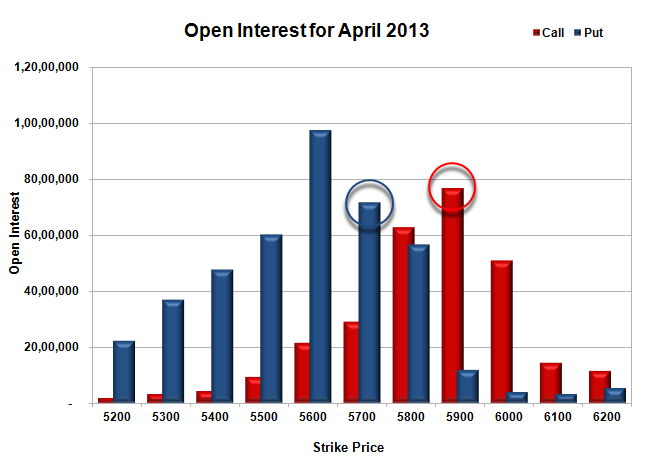 Initial support at 5800, with huge OI of 61.66 lacs and below that at 5700 with huge OI of 73.3 lacs. 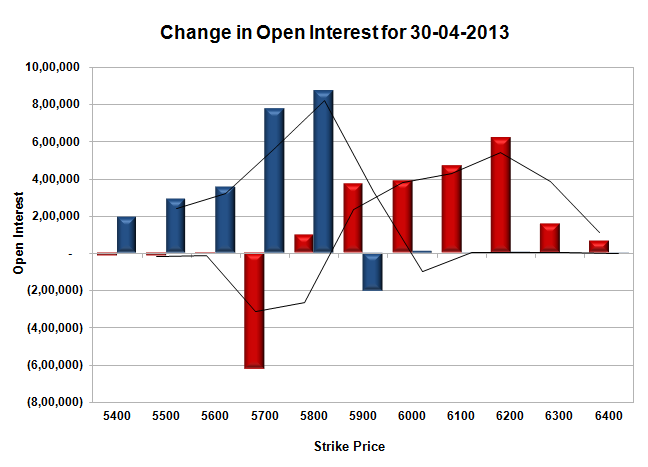 Initial and best Resistance right now at 5900, with OI of 80.45 lacs. 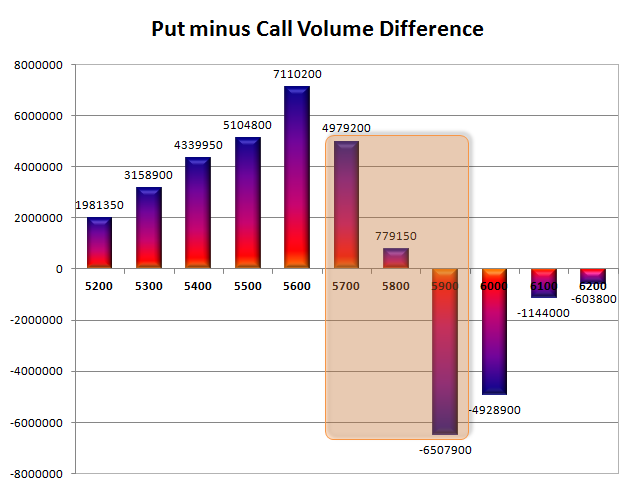 Range as per Option Table is 5770 - 5886 and as per VIX is 5791 - 5883 with 5810 as the Pivot. The index opened positive and after a small up move towards 5835 saw a dip below 5800 which was promptly bought. From there on the index gathered steam and went above 5840 to close around the highs of the day at 5834.40, a huge gain of 51.30 points and in the process closed above the psychological level of 5800 after 22 sessions. The broader market was also positive, with 832 advances to 469 declines. The Option Table is delicately placed with 5800 as the Pivot. Call option 5900-6000 added 7.38 lacs huge amount of OI with huge liquidation seen at 5800 and below strike prices. Put option 5900-5800 added 24.96 lacs huge amount of OI with profit booking seen at 5700 and below strike prices. Highest accumulation on Call option 5900 at 76.62 lacs & 5800 at 62.70 lacs whereas Put option 5600 at 97.31 lacs & 5700 at 71.59 lacs. Nifty Open Interest is at 1,42,56,250 down by 33,33,450, whereas May series added 27.29 lacs, with huge increase in price, most probably rollover with some short covering in current series. Bank Nifty Open Interest is at 16,22,825, down by 2,58,000, whereas May series also added 2.35 lacs with increase in price, most probably huge rollover with some short covering in current series. FII’s bought huge 20.40 lacs of Futures, most probably short covering, as their net OI decreased by 24977 contracts and the average price per contract comes to around 5882. FII’s future open contract as on date is 392028. 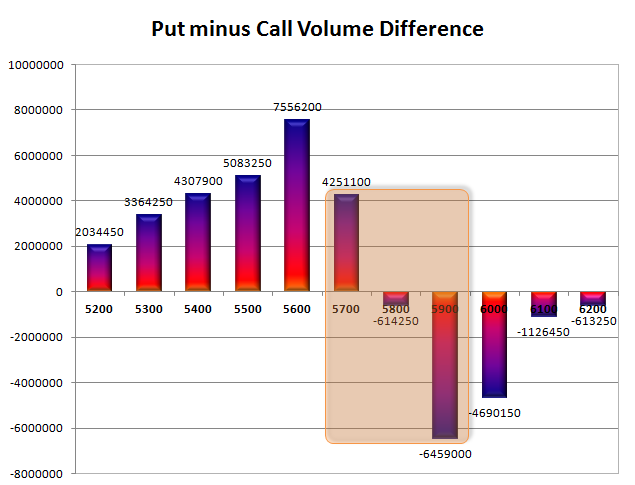 PCR Open Interest (Volume) has jumped to 1.447, the best of the series due to huge liquidation at 5700-5800CE. Support at 5700, with huge OI of 71.59 lacs and below that at 5600 with highest OI of 97.3 lacs. Initial and best Resistance right now at 5900, with OI of 76.62 lacs. 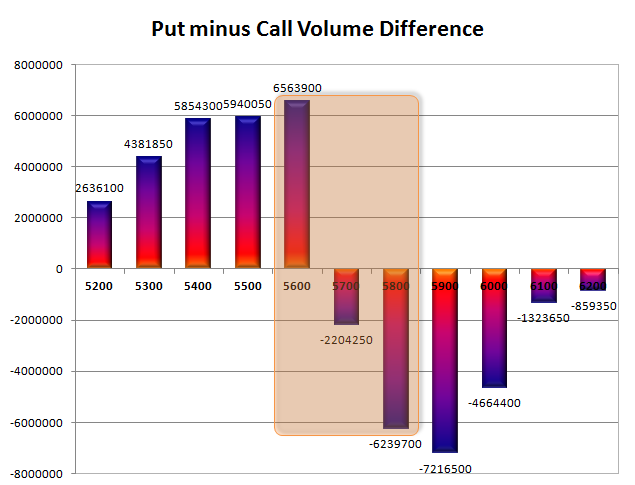 Range as per Option Table is 5767 - 5884 and as per VIX is 5785 - 5884 with 5810 as the Pivot. The index opened flat and took off after a small dip towards the previous day’s close to eke out a huge 94.40 points, just a few points away from the psychological level of 5800 to close at 5783.10. It was one of the best week for the index with a gain of 254.55 points or 4.6%. The broader market was also positive, with 784 advances to 503 declines. The Option Table is truly in control of the Bulls with 5800 within reach. Call option 5800 added 5.39 lacs huge amount of OI with huge liquidation seen at 5700 and below strike prices. Put option 5800-5500 added 55.19 lacs huge amount of OI with profit booking seen at 5400 and below strike prices. Highest accumulation on Call option 5800 at 78.60 lacs & 5900 at 71.30 lacs whereas Put option 5600 at 1.11 crore & 5500 at 84.78 lacs. Nifty Open Interest is at 1,75,89,700 down by 14,19,200, whereas May series added 12.18 lacs, with huge increase in price, most probably short covering in current series. Bank Nifty Open Interest is at 18,80,825, up by 1,55,775, whereas May series also added 0.66 lacs with increase in price, most probably huge-huge long build-up. FII’s bought huge 13.57 lacs of Futures, most probably short covering, as their net OI decreased by 5034 contracts and the average price per contract comes to around 5823. FII’s future open contract as on date is 417005. PCR Open Interest (Volume) has jumped to 1.371, the best of the series due to huge liquidation at 5700CE. Best support has just moved up to 5700, with huge addition for the day at 12.60 lacs and below that at 5600 with OI of 1.11 crore. 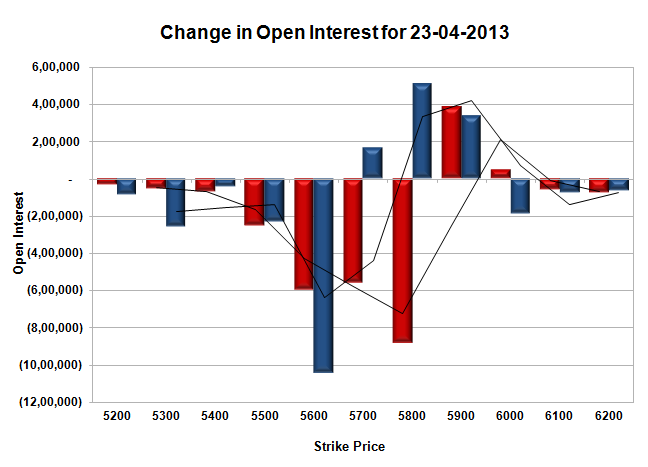 Initial Resistance right now at 5800, with OI of 78.60 lacs and above that at 5900 with OI of 71.30 lacs. 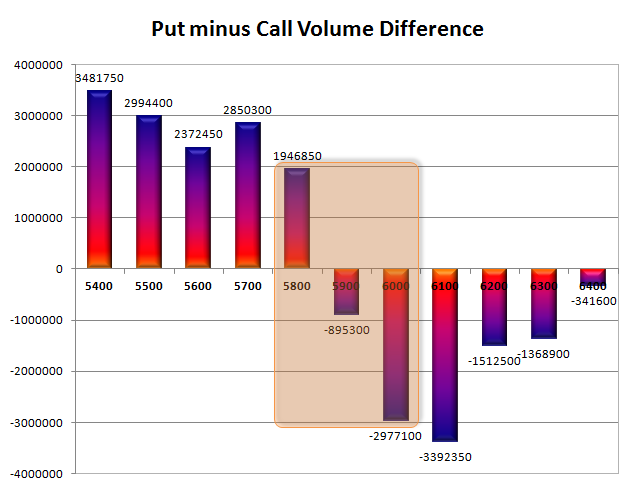 Range as per Option Table is 5703 - 5818 and as per VIX is 5737 - 5830 with 5760 as the Pivot. The index opened positive, but went to touch the previous day’s close within the first few minutes of trade. From there on the index moved up to scale 5730, but was unable to sustain the highs and closed flat at 5688.70, a miniscule loss of 0.25 points. The broader market was flat, with 640 advances to 638 declines. The Option Table now has OI of more than 1 crore at 5600PE level. 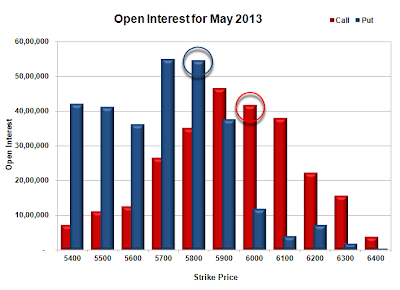 Call option 5700-6000 added 16.09 lacs huge amount of OI with huge liquidation seen at 5600 and below strike prices. Put option 5800-5600 added 29.10 lacs huge amount of OI with profit booking seen at 5500 and lower strike prices. Highest accumulation on Call option 5700 at 83.64 lacs & 5900 at 78.99 lacs whereas Put option 5600 at 1.02 crore & 5500 at 77.42 lacs. Nifty Open Interest is at 1,90,08,900 down by 8,12,100, whereas May series added just 2.42 lacs, with no change in price, most probably huge long liquidation. Bank Nifty Open Interest is at 17,25,050, up by 1,59,500, whereas May series also added small 0.19 lacs with increase in price, most probably huge-huge long build-up. FII’s bought huge 7.07 lacs of Futures, most probably short covering, as their net OI decreased by 8148 contracts and the average price per contract comes to around 5727. FII’s future open contract as on date is 422039. PCR Open Interest (Volume) is up again and now at 1.091 due to huge addition at 5600-5700PE. 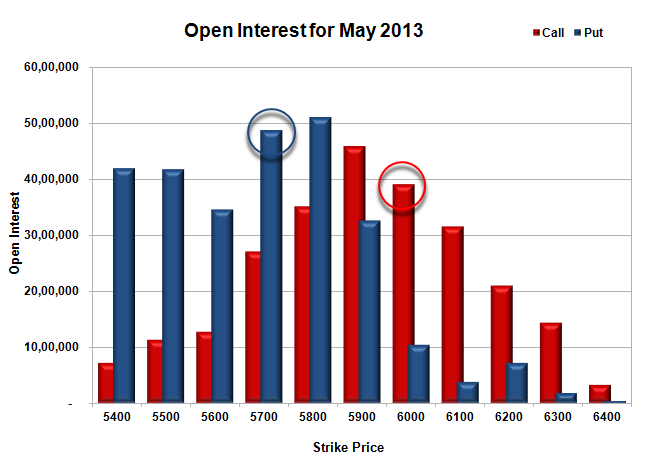 Best support at 5600, with OI above 1.02 crore and below that at 5500 with OI of 77.4 lacs. Initial Resistance still at 5700, with OI now again above 83.64 lacs and above that at 5800 with OI of 73.2 lacs. 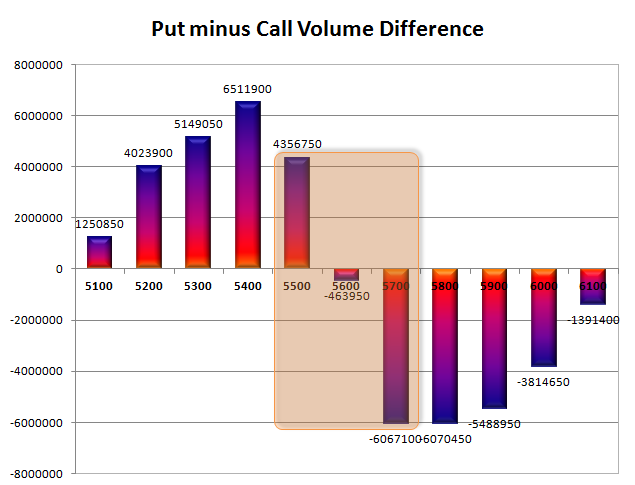 Range as per Option Table is 5639 - 5752 and as per VIX is 5640 - 5737 with 5690 as the Pivot. The index opened flat and from the word go, the Bulls took charge and did not for a single minute let the Bears to have a look in. The index was up by 2.2%, the highest one day move in many days to close at 5688.95, a huge gain of 120.55 points. The broader market was also positive, with 814 advances to 479 declines. The Option Table has turned Bullish with today’s price action. Call option 5900-6000 added 15.28 lacs huge amount of OI with huge liquidation seen at 5600 and below strike prices. Put option 5700-5500 added 55.35 lacs huge amount of OI with profit booking seen at 5400 and lower strike prices. Highest accumulation on Call option 5700 at 78.63 lacs & 5900 at 72.14 lacs whereas Put option 5600 at 87.11 lacs & 5500 at 86.55 lacs. 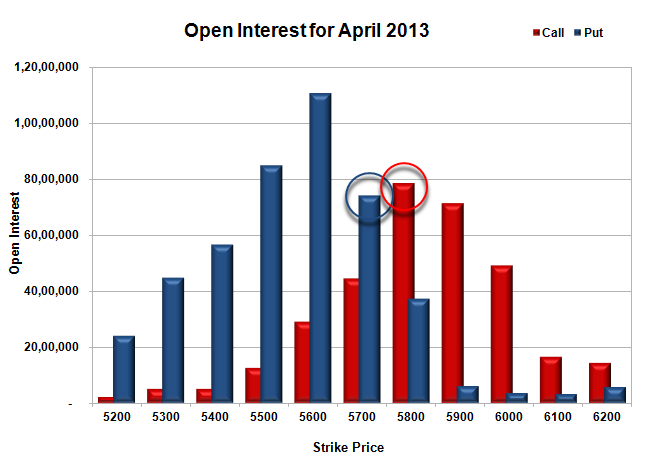 Nifty Open Interest is at 1,98,21,000 down by 16,31,550, with increase in price, most probably huge short covering. Bank Nifty Open Interest is at 15,65,550, up by 2,19,575, with increase in price, most probably huge-huge long build-up. FII’s bought huge 22.45 lacs of Futures, most probably short covering, as their net OI decreased by 44262 contracts and the average price per contract comes to around 5720. FII’s future open contract as on date is 430187. 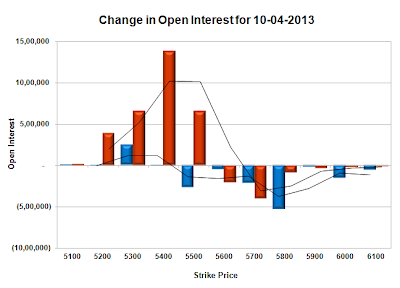 PCR Open Interest (Volume) is up at 1.048 due to huge addition at 5600-5700PE. Support just moved up to 5600, with huge addition for the day and now OI above 87.1 lacs and below that at 5500 with OI of 86.6 lacs. Initial Resistance still very much at 5700, though covered huge, but OI still above 78.63 lacs and above that at 5800 with OI of 69.5 lacs. 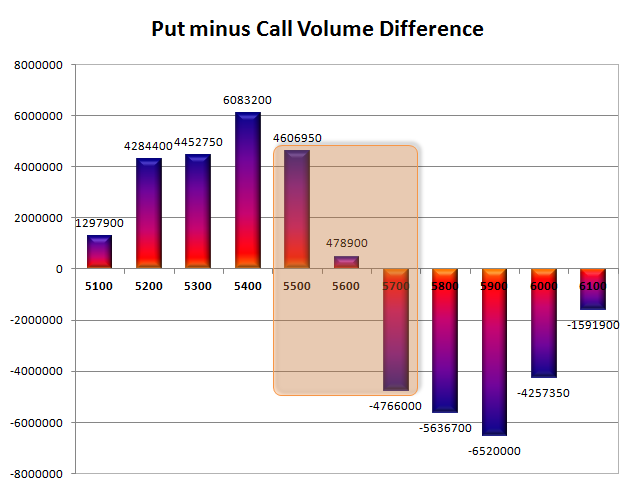 Range as per Option Table is 5601 - 5716 and as per VIX is 5641 - 5737 with 5665 as the Pivot. The index opened negative but saw the responsive buyers moving in to take the index from the lows of 5500 to the highs around 5600. The Bears or the responsive sellers who are stationed around 5600 came out to push the index back around 5560 level to close just at 5568.40, still a comfortable gain of 39.85 points. The broader market was also positive, with 699 advances to 575 declines. The Option Table for the time being looks range bound between 5500-5700 level. Call option 5500 & 5700 added 8.33 lacs huge amount of OI with huge liquidation seen at 5600 strike price. Put option 5600-5300 added 34.14 lacs huge amount of OI with profit booking seen at 5200 and lower strike prices. 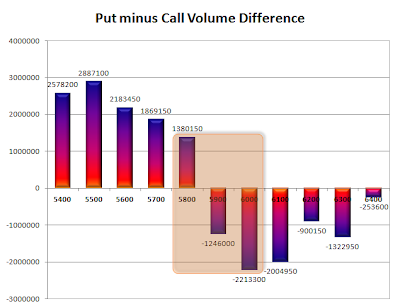 Highest accumulation on Call option 5700 at 84.36 lacs & 5800 at 71.33 lacs whereas Put option 5500 at 83.16 lacs & 5400 at 74.05 lacs. 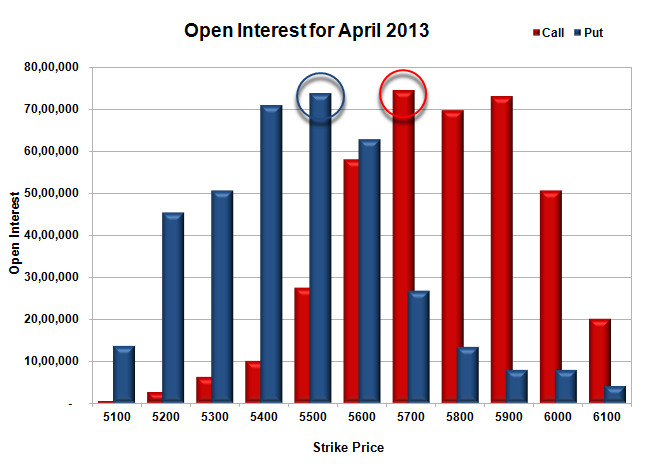 Nifty Open Interest is at 2,14,52,550 up by 12,14,300, with increase in price, most probably huge long build-up. 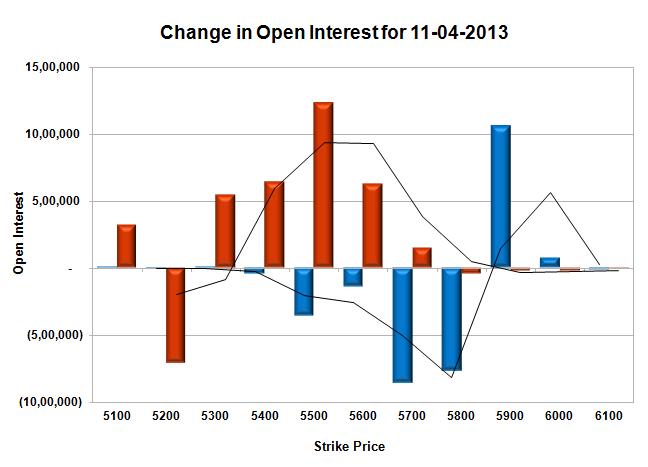 Bank Nifty Open Interest is at 13,45,975, down by 35,000, with increase in price, most probably huge short covering. FII’s sold huge 1.99 lacs of Futures, most probably short build-up, as their net OI increased by 21622 contracts and the average price per contract comes to around 5586. FII’s future open contract as on date is 474449. PCR Open Interest (Volume) is up at 0.933 due to huge addition at 5500 PE. Support just got better at 5500, with huge addition for the day and now OI above 83.16 lacs and below that at 5400 with OI of 74.0 lacs. Initial Resistance still very much at 5600, though covered huge, but OI still above 64.18 lacs and above that at 5700 with highest OI of 84.4 lacs. Range as per Option Table is 5503 - 5614 and as per VIX is 5520 - 5617 with 5555 as the Pivot. The index opened huge down, due to a shocker from the IT giant, Infosys, which went down more than 21%. Nifty was unable to move up in intra trade also and any small up-move was sold-off. The index ultimately closed at 5528.55, a huge loss of 65.45 points. On a week on week basis the index lost 0.44% or around 24.70 points. The broader market was also weak, with just 528 advances to 754 declines. The Option Table is back in the hands of the Bears after a small hiatus. Call option 5500-5800 added 28.68 lacs huge amount of OI with profit booking seen at 5900-6100 strike prices. 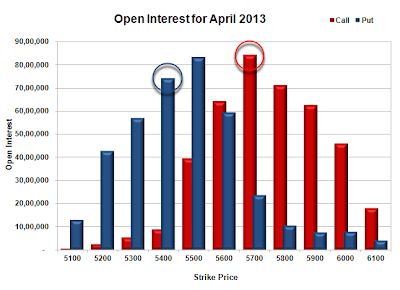 Put option 5300-5200 added 4.17 lacs huge amount of OI with short covering seen at 5600 and above strike prices. 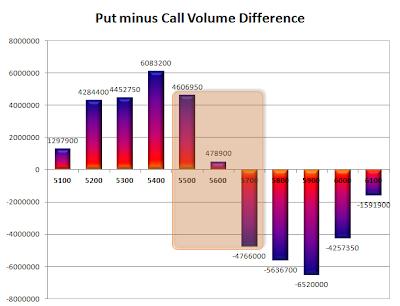 Highest accumulation on Call option 5700 at 80.32 lacs & 5800 at 72.76 lacs whereas Put option 5500 at 65.99 lacs & 5400 at 65.59 lacs. 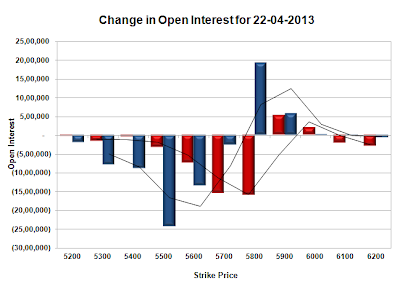 Nifty Open Interest is at 2,02,38,250 up by 4,06,250, with huge decrease in price, most probably huge short build-up. Bank Nifty Open Interest is at 13,80,975, up by 91,800, with increase in price, most probably huge long build-up. FII’s sold huge 7.30 lacs of Futures, most probably short build-up, as their net OI increased by 22342 contracts and the average price per contract comes to around 5551. FII’s future open contract as on date is 452827. 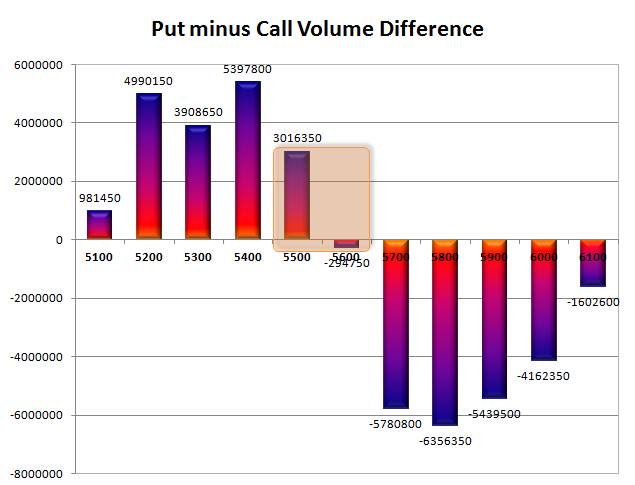 PCR Open Interest (Volume) moved down to 0.868 due to huge liquidation at 5400-5600PE levels. 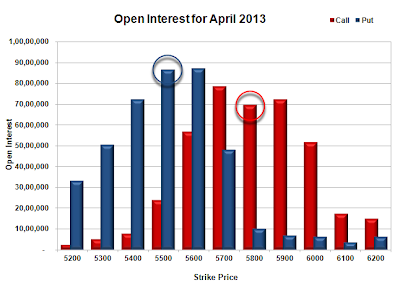 Best Support still at 5500, though covered huge OI and below that at 5400 with OI of 65.6 lacs. Initial Resistance now at 5600 with huge addition for the day at 12.08 lacs and OI above 70.2 lacs and above that at 5700 with highest OI of 80.3 lacs. Range as per Option Table is 5470 - 5579 and as per VIX is 5481 - 5576 with 5585 as the Pivot. A repetition of what happened yesterday with the index opening positive and then traded in a narrow range for the better part of the morning session. A huge sell-off saw the index down by 40 points within minutes but the responsive buyers took control from thereon to move the index to the highs of the day around 5610 but closed marginally lower at 5594.00, still a good gain of 35.30 points. The broader market though was just positive, with 686 advances to 595 declines. The Option Table right now is neutral with 5600 acting as pivot. 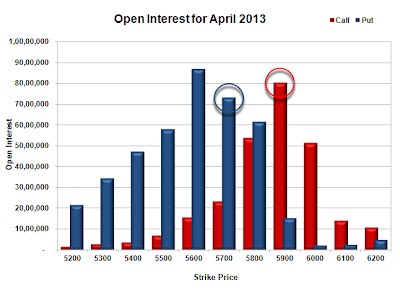 Call option 5900-6000 added 11.33 lacs huge amount of OI with profit booking seen at 5700-5800 strike prices. Put option 5700-5300 added 31.96 lacs huge amount of OI with profit booking seen at 5200 strike price. Highest accumulation on Call option 5700 at 74.46 lacs & 5900 at 73.07 lacs whereas Put option 5500 at 73.68 lacs & 5400 at 70.88 lacs. 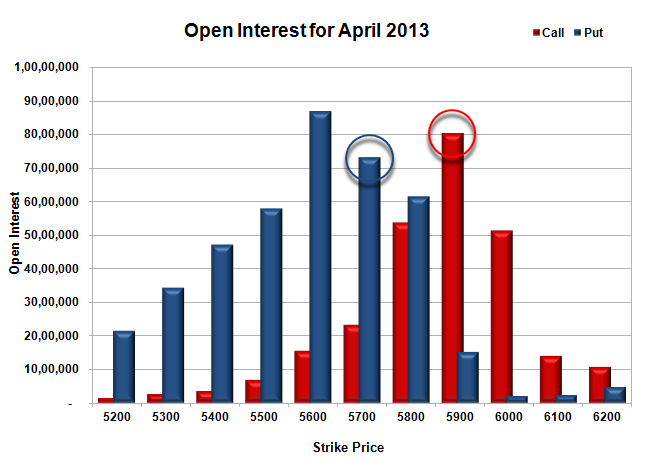 Nifty Open Interest is at 1,98,32,000 up by 8,01,750, with increase in price, most probably huge long build-up. 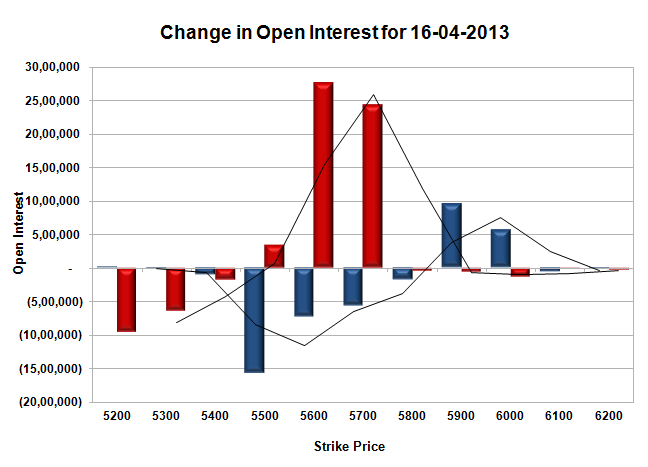 Bank Nifty Open Interest is at 12,89,175, up by 51,875, with increase in price, most probably huge long build-up. FII’s bought huge 4.79 lacs of Futures, most probably long build-up, as their net OI increased by 11284 contracts and the average price per contract comes to around 5602. FII’s future open contract as on date is 430485. 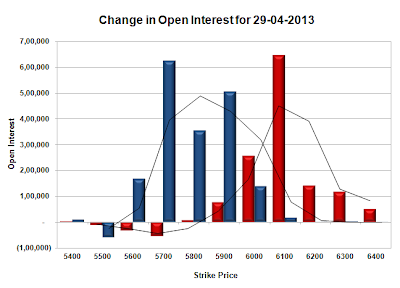 PCR Open Interest (Volume) has moved up to 0.940 due to huge addition at 5500PE. 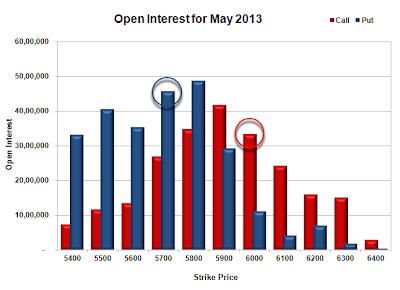 Best Support right now at 5500, with OI above 73.7 lacs and below that at 5400 with OI of 70.9 lacs. Resistance now at 5700 with highest OI of 74.5 lacs and above that at 5800 with OI of 69.7 lacs. 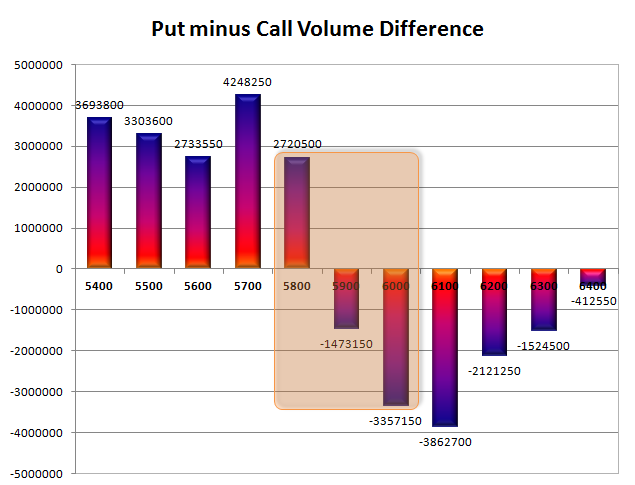 Range as per Option Table is 5533 - 5640 and as per VIX is 5544 - 5644 with 5585 as the Pivot. A flat to positive opening saw the index trading in a narrow range during most of the most of the morning session. A huge sell-off saw the index down by 50 points within minutes but the responsive buyers took the opportunity and moved the index to the highs of the day around 5565 to close just below it at 5558.70, still a good gain of 63.60 points. The broader market though was just positive, with 669 advances to 613 declines. The Option Table is still tilted very much towards the Bears. 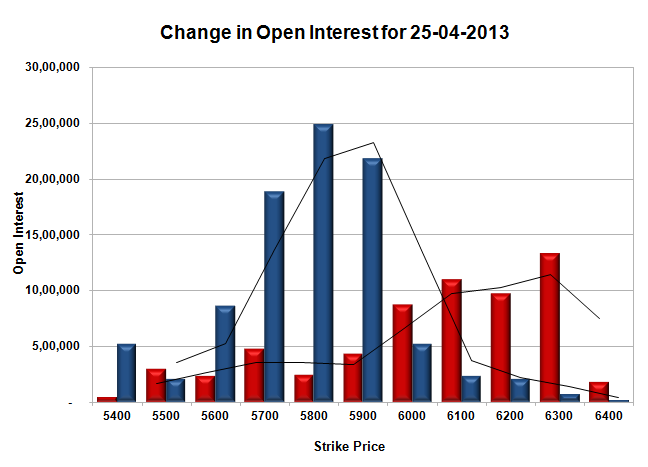 Call option 5300 added 2.48 lacs huge amount of OI with profit booking seen at 5600 and above strike prices. Put option 5500-5200 added 30.77 lacs huge amount of OI with huge short covering seen at 5600 and above strike prices. Highest accumulation on Call option 5700 at 83.09 lacs & 5800 at 77.40 lacs whereas Put option 5400 at 64.45 lacs & 5500 at 61.40 lacs. 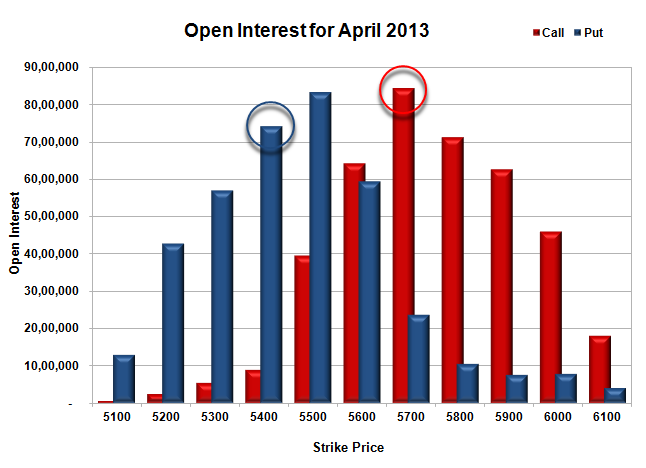 Nifty Open Interest is at 1,90,30,250 up by 7,89,700, with increase in price, most probably huge long build-up. 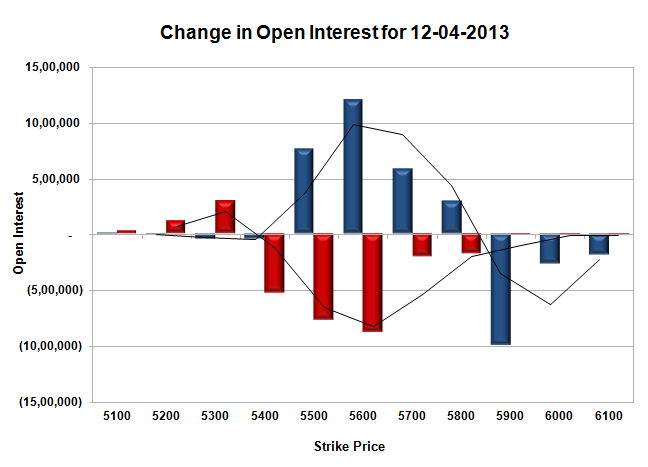 Bank Nifty Open Interest is at 12,37,300, up by 425, with increase in price, most probably small long build-up. FII’s sold 3.90 lacs of Futures, most probably short build-up, as their net OI increased by 23002 contracts and the average price per contract comes to around 5566. FII’s future open contract as on date is 419201. 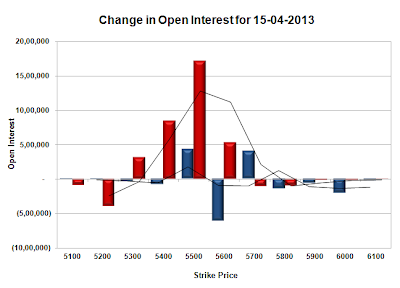 PCR Open Interest (Volume) has jumped to 0.857 due to huge addition at 5400PE. Support right now at 5500, with OI just above 61.4 lacs and below that at 5400 with OI of 64.45 lacs. Resistance still at 5600 with OI now just below 60 lacs and above that at 5700 with highest OI of 83.09 lacs. Range as per Option Table is 5488 - 5596 and as per VIX is 5511 - 5607 with 5545 as the Pivot.